As a follow up to one of my earlier posts where I Create AD Users with SharePoint Online as frontend, I now wanted to share an extension of this solution where we will utilize Azure Automation with a Hybrid Worker to do the heavy lifting. 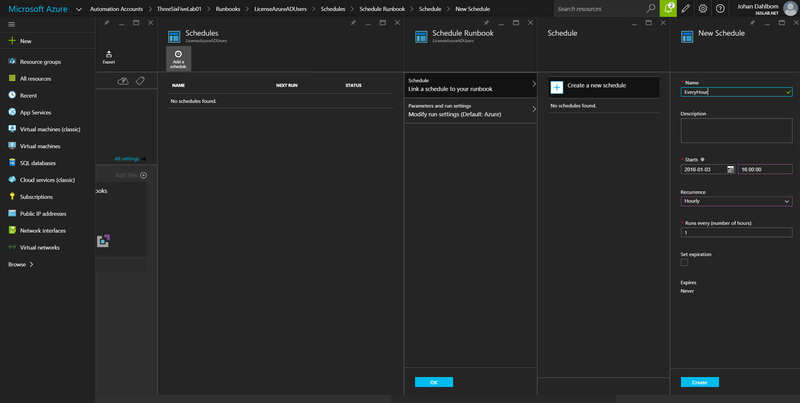 So basically, instead of having a script as a scheduled task reading the SharePoint list and perform tasks based on status, we will now have a SharePoint workflow to initiate our runbooks through an Azure Automation Webhook. 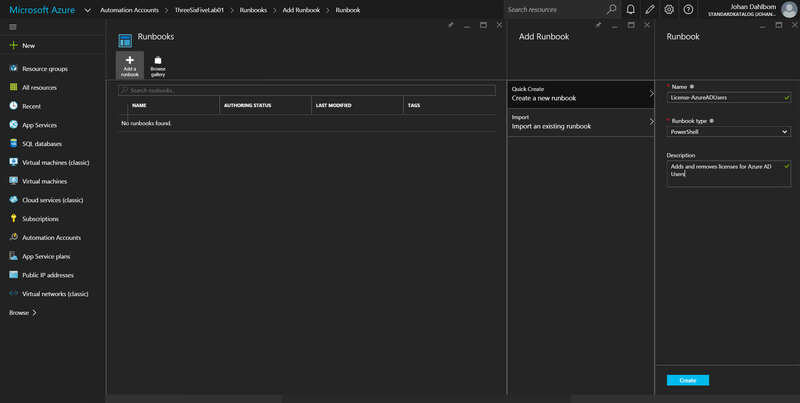 Create an Azure Automation runbook with a WebHook that executes the runbook on a Hybrid Worker. Create a basic SharePoint workflow in SharePoint Designer with approval steps prior creating the user. I assume that you already have the following in place. A custom SharePoint list with columns to fit your needs. A machine with Sharepoint Designer 2013 installed. Note that you need to have Service Pack 1 installed in order to connect to SharePoint Online. An Azure Automation Account with a Hybrid Worker registered. Note that you since a couple of weeks can run your Hybrid worker with a other credentials then local system, which is really nice in our particular case. Since I will use Tao Yang’s SharePointOnline PowerShell module which is utilizing the SharePoint Server 2013 Client Components SDK to integrate with SharePoint Online, that module including the SDK needs to be installed on the Hybrid Worker(s) as well. A service account that have permissions to the SharePoint list that will be used to write back status and information. I will use Azure PowerShell create and publish the runbook. 1. First we need to create a credential asset that will be used to write back information to our list. 2. Next up we need to create the actual runbook. Since we are doing everything with PowerShell, we need to save the script to a file and import it to Azure Automation. My example runbook (CreateADUserfromSPO.ps1) can be found below. Name = "$FirstName $LastName ($sAMAccountName)"
Write-Verbose "Successfully created the user $($ADUserHt.Name)"
Write-Warning "Error creating the user $($ADUserHt.Name) `r`n$_"
3. 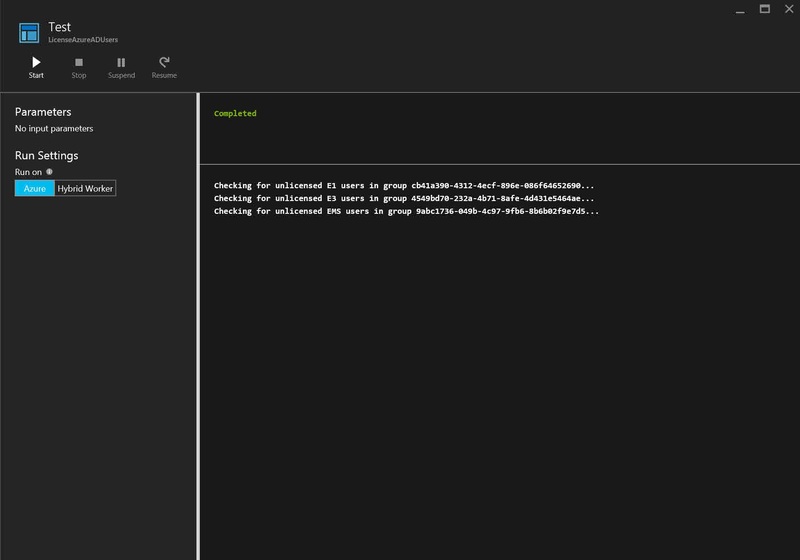 Last step is to create the Webhook that will be used when triggering the runbook from the SharePoint workflow. As notified when running the cmdlet, save the WebhookURI, you will need it later and cannot see it more than on Webhook creation. I have set the Webhook expirytime to 2 years, change it according to your needs. 1. Open SharePoint Designer and open your website containing the custom list. 2. Add a new List Workflow to your site and associate the workflow with your custom list. 3. Click on the workflow and edit the Start Options to kick of the workflow when a new item has been created. 4. Edit and customize the workflow to fit your needs. In my case, I will have one stage for manager approval and one stage for executing the automation runbook. a. 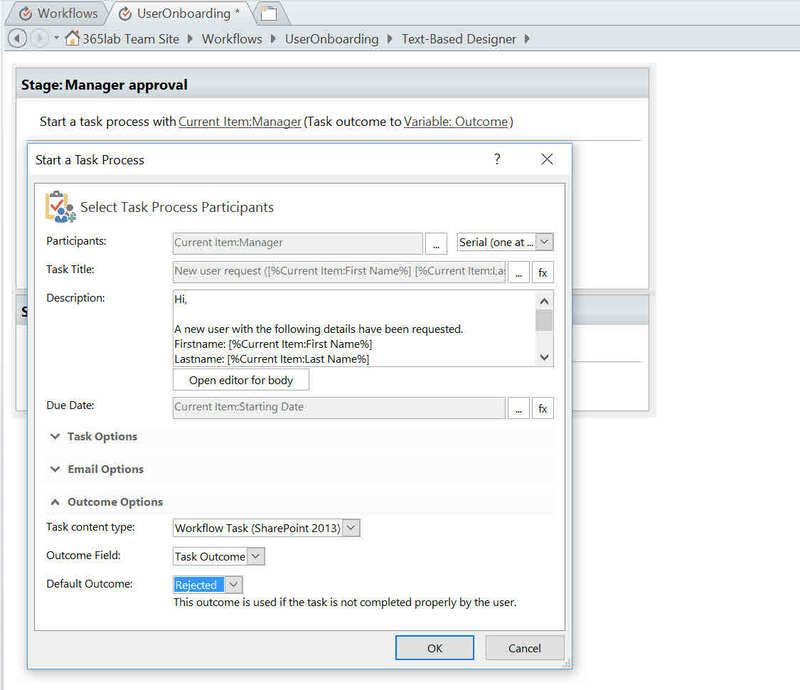 Create a “Start a task process action” to submit the request to the manager. b. Create a condition to Execute the runbook if the request was approved. a. First build a dictionary with the data you want to pass to the automation webhook. b. Insert a “Call HTTP Web Service” action and configure it to POST the earlier created dictionary to the Webhook url you saved creating the Webhook. c. Our last step before ending the workflow will be to write back the response from the webhook to the SharePoint list item. This makes it easier for us to track if the task was properly submitted to Azure Automation. 5. Check the workflow for errors before saving and publishing. This is my finished workflow before publishing it. First, we create a new item in the SharePoint list to start the process. The manager approval process sends an email to the new users manager as we stated in the workflow. After the manager has approved the request, the workflow will kick off the runbook, create the user in Active Directory and write back the UserName/EmailAddress and status of the newly created user to the list. In this example, a password is generated but not distributed to anyone. My hope is that you with this post have got some inspiration on what you can achieve with Azure Automation in combination with SharePoint (Online or On-Prem). Sky is the limit! This entry was posted in Active Directory, Azure, PowerShell and tagged Azure Automation Webhook, Create AD user Azure Automation, SharePoint Online Workflow Webhook on January 9, 2016 by Johan Dahlbom. Many of the scripts used to assign licenses for Azure AD / Office 365 users are utilizing groups to assign the licenses. On the topic I have received quite a lot requests on nested group support, which is not possible with Get-MsolGroupMember as of now. To solve this problem, I have built a simple function canned Get-JDMSOLGroupMember. It checks if a group consists of other groups, and loops through them until all group members of all groups have been enumerated. In the end it will sort the members so that no duplicate member records are returned. It will only return users, not groups. 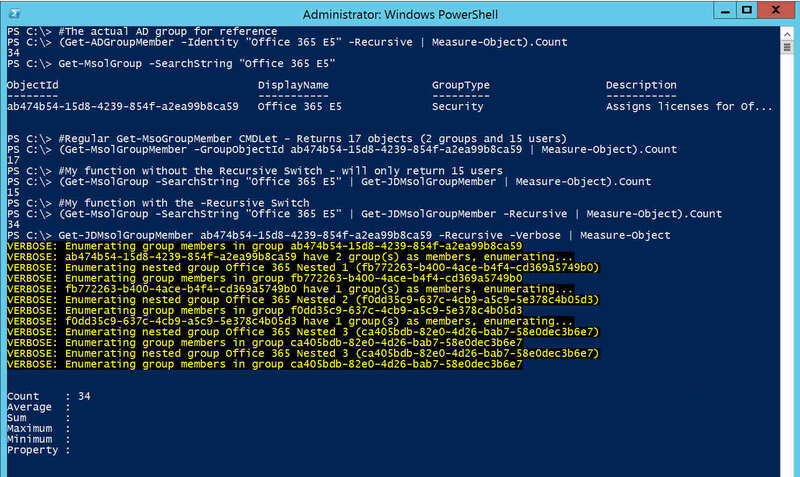 The function enumerates Azure AD Group members with the support for nested groups. Write-Verbose -Message "Enumerating group members in group $ObjectId"
Write-Verbose -Message "$ObjectId have $($GroupsMembers.count) group(s) as members, enumerating..."
Write-Verbose "Enumerating nested group $($_.Displayname) ($($_.ObjectId))"
As usual, let me know if you find issues or have any other suggestions. This entry was posted in Office 365, PowerShell and tagged Azure AD Nested Groups, Get Azure AD Group Nested, Get-MsolGroupMember -Recursive, Get-MsolGroupMember Nested on January 7, 2016 by Johan Dahlbom. A while ago I wrote a post regarding schedule your Office 365 automation jobs in Azure Automation. At that time, the Azure AD PowerShell module did not support Azure Automation due to the Online Services Sign in Assistant dependency. The preview Azure AD PowerShell module released in september do however use ADAL for authentication which solves this problem. This is great news for all currently running licensing scripts in regular servers as scheduled tasks! Since many probably will move from their scheduled tasks to Automation for their licensing scripts, I thought it was a good idea sharing on how to make the switch. I will use the “new” Azure portal and assume that you already have an Automation account. The following code assumes that you have installed the modules in the default location and the zip files will be put on your desktop. 2. Upload the zipped modules files as assets to your automation account. 3. Now add your license service account as an asset to your automation account. If you haven’t created one you can use the below PowerShell lines to do it. Note that the account only needs to have the “User management administrator” role. #Add the user as an "User Account Administrator"
4. Create your runbook and import the script. In this case I am using a slight modified version of this script, which you will find if you expand the script below below. This version are using the GroupObjectGuid to identify the groups instead of the DisplayName. Since the script is using Write-Output and Write-Warning for logging, Azure Automation will automatically handle basic logging. Write-Output "Checking for unlicensed $license users in group $GroupID..."
Write-Warning  "Group $GroupID is empty - will process removal or move of all users with license $($AccountSKU.AccountSkuId)"
Write-Warning "Error when licensing $User$_"
5. Verify that the runbook is working as intended by starting it in the test pane. Make sure to solve eventual errors before you publish and schedule the runbook. The most common error is login errors for the automation service account. 6. Publish and schedule the runbook. In my case I will run it one time every hour. You are now all set and can hopefully disable a scheduled task in your on premises environment. If thinking about running this in production, keep in mind that the PowerShell module is still in preview (I haven’t experienced any problems, but…). Let me know if you have any questions or suggestions, and happy automation! This entry was posted in Azure, Office 365, PowerShell and tagged Azure Automation, Office 365 License Azure Automation on January 3, 2016 by Johan Dahlbom.